After 4 weeks of adhering fairly closely to the Hal Higdon Advanced 5K training plan, I ran my 5K test on Saturday morning. Instead of running in an organized race, I went out to one of my favorite routes along the Arkansas River here in Tulsa and ran solo, relying on my Apple Watch to track my pace. To be honest, I really thought I could break 20 minutes in this run. My old PR came from running 30 miles per week in 3 runs, all of which were in the 8:00 – 9:30 pace range. I would occasionally dial my pace down into the mid-7’s, but I never spent any significant time below 7. So when I started doing a real 5K training plan, working at speeds faster than my goal pace, I thought breaking 20 would be easy. Saturday was almost perfect for my 5K test run. Although I’m no fan of cool weather, it does allow me to push the pace a bit longer so sunny and low 50’s seemed about right. The only problem was a fairly stiff wind out of the Southwest. That meant a couple of 1/4 mile sections with a headwind, less tailwind than I expected, and another 1/2 mile with a crosswind. The wind also kept me a little chillier than I would like, and at my age, running without a decent sweat means I’m a bit less flexible. After a brief warmup, Mile 1 started off too fast as usual. I thought with it not being an organized race that I could dial it back a bit, but my early pace was in the 5’s. 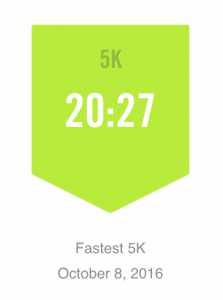 I didn’t settle into my goal pace until around the 3/4 mile mark. On top of that, I saw my first headwind in that last 1/4 mile, leaving me slipping below goal pace as the mile ended. With a 6:14 1st mile, though, I was still in good position to break 20 minutes. Fortunately, I caught the tailwind near the start of Mile 2. I hoped it would help me latch onto 6:25 pace and hold it, but it was short-lived and bracketed by a couple of small hills. Mile 2 also included a busy bridge with an unusual transition between the connecting trails where I may have lost a couple of seconds dealing with sharp corners and cyclists. During Mile 2, my pace gradually drifted from 6:25 down to 6:40 for a time of 6:37. Mile 3 did not start well as the first 1/4 mile was into the wind, and once the trail turned back North, I was catching a nasty crosswind. I don’t know about most runners, but I hate crosswinds only slightly less than headwinds. I knew I needed to pick up the pace, but my body wasn’t having it. I managed to hold on for dear life with a mile 3 time of 6:41. When the run ended, I was pretty annoyed with the time I saw on my watch. I thought I had run just a second slower than my previous PR (20:27), but my run brain had failed to remember that Nike Plus just keeps on tracking after you finish a distance run. I had to get back to my phone before I would see my PR time of 20:12 (or 20:13 on the website…seriously Nike, what’s up with that…seconds matter). Needless to say, most runners would view a 14 second improvement in their 5K PR as a success, but I have mixed feelings. Like I said, I went out there expecting to break 20. Conditions weren’t quite perfect, but they were close. I’m now left wondering if 4 more weeks on this plan will get the job done, or if I need to change it up a bit. One change I will definitely make is wearing the Elevation Training Mask for the Monday 3 mile easy runs. My legs were getting the job done Saturday, but my heart and lungs were struggling. Instead of trying to change up speed or distance, I’m going to use the breathing restriction to add some intensity and hopefully fix up the cardiovascular side of the equation. Another change I’m considering is substituting 800’s for 400’s and 400’s for 200’s. I think the 400’s are beneficial, but the 200’s just feel too short to be useful. 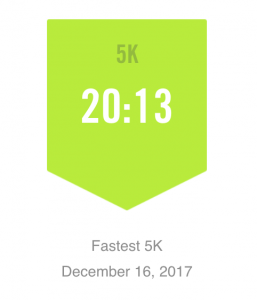 If I was struggling with raw foot-speed, I can see where the 200′s would help, but I’m not so I think the time could be better spent on speed and endurance. Last but not least, I already changed my cross-training heavy lower-body strength training in Week 4. My legs are only accustomed to 3 runs per week, regardless of distance, so I wasn’t adding strength training for fear of injury or fatigue. I think that was a mistake so I’m adding back in heavy calf and hamstring work and doing the best I can with quads (back and ankle issues make squats a challenge). If my training is interrupted by Christmas too much, I’ll rewind a week or two on the training plan and continue forward. 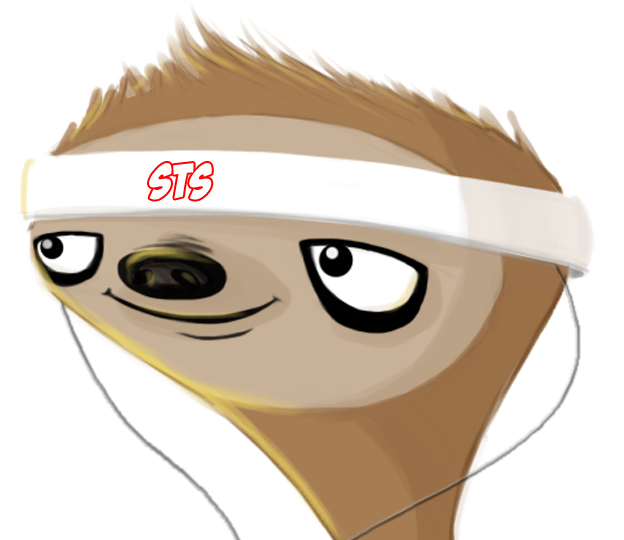 Hopefully I can find a flat, fast 5K sometime in mid-January for my next, and hopefully final, attempt.